About this time last year I bought two kits from Jared Flood. The first I made as a Rosebud hat a present for one DIL. I liked the pattern but did not like the wool It was splitty and full of vegetable matter and seeds. I doubt Australian Customs would have been impressed if they had inspected. Their policies are very strict, as they ought to be. 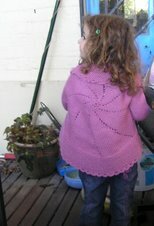 The second was for the Sempervivum shawl which I wanted as something to concentrate on. As things turned out, I didn't use it and took it out only a week ago. Now I've used patterns from there before. They are attractive garments, patterns are well written and illustrated and easy to follow. But not this one. For almost all my life I was a very verbal person, quite happy to follow written instructions in knitting patterns. About ten years ago, I made myself learn how to read and work from charts and much to my surprise, I like them. Since then, I use charts and like seeing how things develop by checking the chart. Not this time. There were charts, four of them. One chart was very large and had been reduced in size to fit on an A4 sheet of card. It was almost impossible for my eyes to read accurately and I knew I would be tearing my hair out trying to follow it. So I ripped out what I had done and spent a lot of time looking for something else to suit yarn and the amount I had. Their kits come only with written patterns. I for one, would appreciate a password protected site where a pdf of the pattern could be downloaded after purchase. I transfer pdfs to Evernote which runs across my computer, iPad and iPhone. I always have access to the pattern. When I use them in iPad or iPhone, I can enlarge the page view with a simple swipe. So easy and so convenient. I have taken a photo in the past and put that on Evernote, but it did not seem to work this time. So what did I find? I decided to try Mairi because of the different techniques used in it. Here's a link. 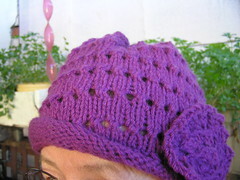 The lacy edge is based on fourteen stitches and a twenty row repeat. 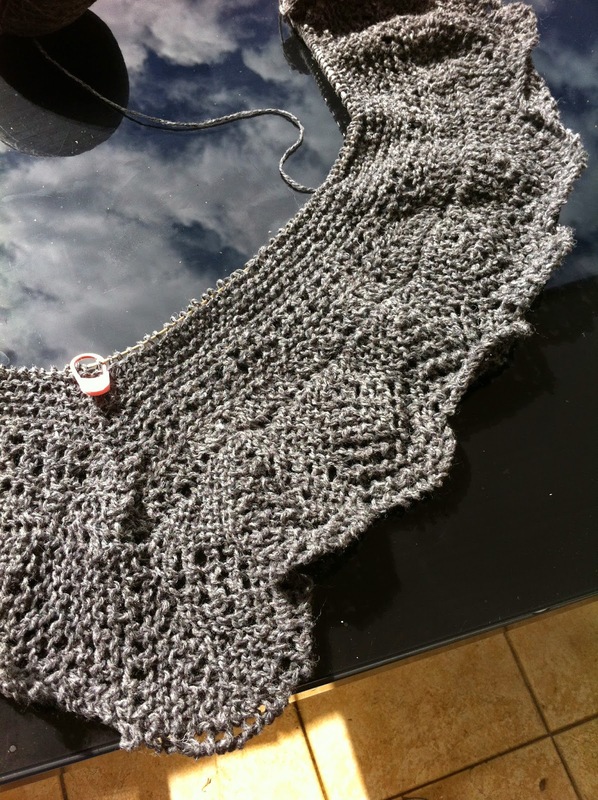 Halfway along the length, a series of short rows forms a turn, and after the remaining edge is done, stitches are picked up for the body of the shawl. Four stitches are decreased every second row for shawl shaping. Obviously my picture shows a work in progress and it should open up with some blocking. Two sons had a quick trip to Melbourne on the Anzac Day long weekend. They rented a furnished apartment and seem to have spent most of the time eating, drinking coffee and listening to live music. They had a great time. They returned Sunday, in the daylight because of work the next day. At Euroa they had a pot of tea in a cafe and bought local jam, quince for me, fig and ginger for them although I like that too. Just out of Euroa, they bought a tray of free range farm eggs, twenty. I already had eight at home, so had to think of a way to use some. I like frittata so decided on that. Mine are always passable, but DIL makes better. So I looked for a recipe to suit what I had. I found asparagus and onion frittata to serve four. I substituted leek as son here loathes onions unless they are chopped so finely they cannot be seen or felt. I even had cream and goats cheese and a fresh block of parmesan, ready to grate. Recipe said it serves four. If served in one go, I think there could be more serves with extra vegetables. We had it with farm mushrooms and son had a large piece of leftovers for lunch next day. My piece was small but I added salad. This was easy to make and delicious. By far the best I have ever made. Photo shows it just after top was grilled. Good news for Miss M. The doctors have suggested she try some school in the off week when she is not in hospital for chemo. They suggested a couple of half days to start with but she was very excited on Monday morning when son picked up her siblings. Uniform on, uniform hat on, huge grin on. She stayed the whole day but has been too exhausted to return. However, it's a step forward for her and she needs to see her friends and be in some sort f routine other than daytime TV. Especially since one person she has met at hospital lost his fight agains leukaemia yesterday. I know the success rate for cures is very high, but it's not 100%. This is the second death in a week I have heard of and I was saddened depute her progress. I try not to think of that small percentage not cured. Mairi is pretty and what an interesting construction too. I remember the not-very-nice wool. Such good news about Miss M, and I know how she felt: going to school at full pelt and then having to rest up. 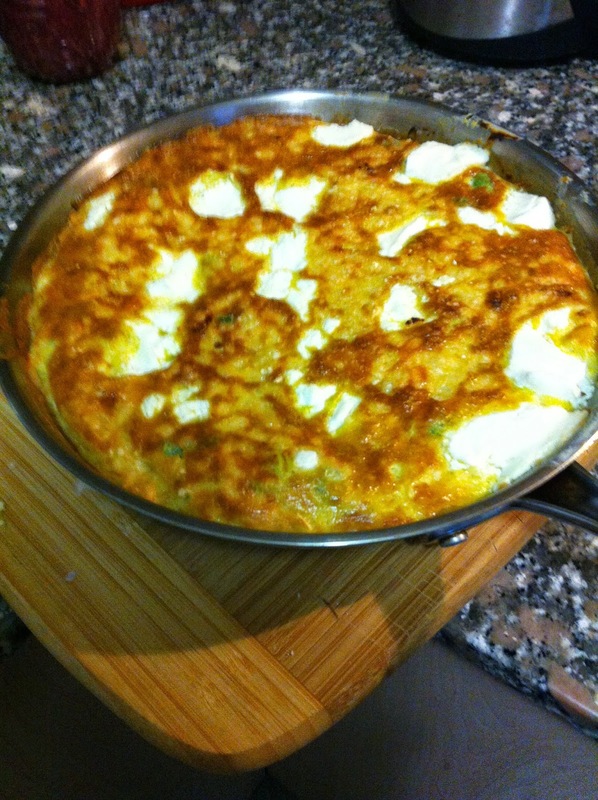 Yum, the fritatta looks scrumptious and sometimes I actually prefer them the next day. I am a next day food person!!! The knitting seems like it was a bit frustrating at that time. The frittata sounds delicious. You are certainly a more adventurous cook than I; we tend to fall back on the same meals over and over. That may change as we start a new eating regime in yet another attempt to lose weight.